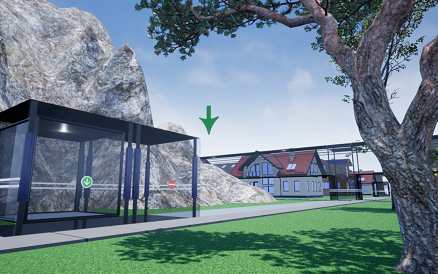 This simulation, in its current video game form, gives to the player the objective of exploring un urban environment aboard an automated transportation system, whose efficiency we hope he'll appreciate, to go realize different proposed weekly activities. This program allows to visualize ping-pong games being played with different numbers of players, each playing on multiple tables at the same time. Tables can be arranged to form a star, an hexagonal grid or around a cube or a dodecahedron. A disposition was added that has Ping-Pong balls made of smaller tables arranged as polyhedrons. The camera can navigate through theses polyhedron nested one in another. Recently, support for play on both sides of ping-pong tables has been added, and the camera can now move inside the polyhodrons. The latest version allows to display a smoother animation with up to 5 levels of nesting. 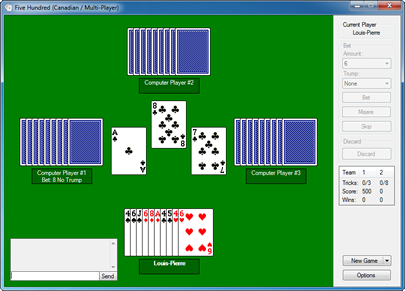 This free Five Hundred (500) cards game for Windows can be played against the computer or online. You can choose from two popular variations of the game: canadian or australian, or costumize the rules to your own preferences. There are options, for exemple, to identify cards that are master, or to display previous played tricks. The AI should be challenging even to the experimented players, thanks to its use of probabilities and memorization. It is also available in French. 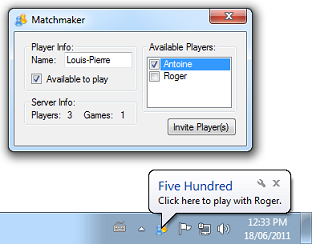 This complement to the Five Hundred game makes finding available players easier. It runs in the background and communicates with the games server to let others know if you are available and to display the list of the people waiting to play. When you see one or more players you would like to play with, select and invite them. If any players accepts, the Five Hundred game will start for all the particiants and you will be ready to play right away!